At a press conference on Monday, United Launch Alliance CEO Tony Bruno unveiled long-awaited plans for the company’s next-generation launch system. As expected, the Vulcan first stage will use two methane-fueled BE-4 engines from Blue Origin. The stage will also accommodate up to six solid-fueled strap-on motors. 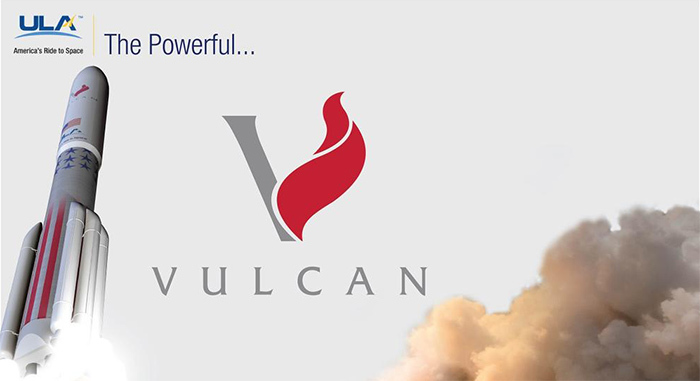 The combination of engines and solid-fueled motors will give Vulcan about 20% greater payload capability than the Atlas V.
If ULA meets its planned schedule (which the company admits is challenging), Vulcan will begin flying in 2019 using the existing Centaur upper stage powered by Pratt & Whitney RL-10 engines. Later, the Centaur will be replaced by an Advanced Cryogenic Evolved Stage (ACES), which will allow Vulcan to achieve the same payload capability as the Delta IV Heavy. For ACES propulsion, ULA is evaluating new engine designs, from Blue Origin and XCOR Aerospace, in addition to the RL-10. ULA is also taking a novel approach to second-stage reusability. Rather than returning the stage to Earth for refurbishing, ULA is designing the stage so it can be restarted and refueled on orbit. This is possible due to an advanced integrated fluids system, which captures boil-off gasses from the liquid-oxygen and -hydrogen tanks. A small internal-combustion engine (about the size of a lawn-mower engine, but with much higher performance) will burn those boil-off gasses. The integrated fluids system will provide vehicle power, depressurize the propellant tanks, and provide attitude-control thrust. This system will allow the stage to operate on-orbit for weeks or months, rather than hours, with unlimited engine restarts. It will be able to maneuver between various orbits in the Earth-Moon system and return to a space station in Low Earth Orbit for refueling and reuse. The internal-combustion engine for the integrated fluids system will incorporate race-car technology developed by the Roush Fenway Racing team. With the new upper stage, however, come new capabilities. 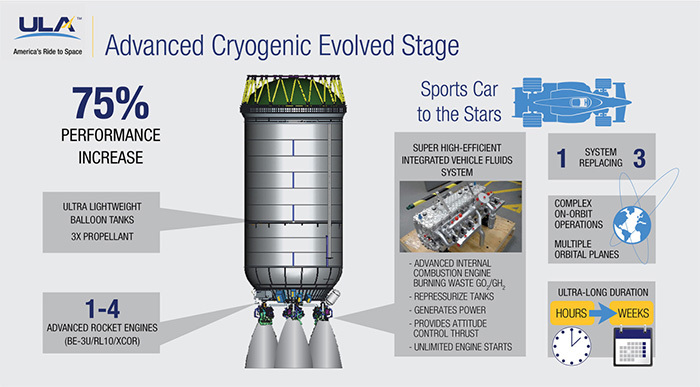 The flexibility of the Advanced Cryogenic Evolved Stage will enable a new mode of operations, which ULA calls distributed lift. The ability to reuse the upper stage as a space tug means that payloads do not need to fit on a single rocket, but can be assembled on orbit. That, in turn, means more efficient payload packaging and innovative architectures. 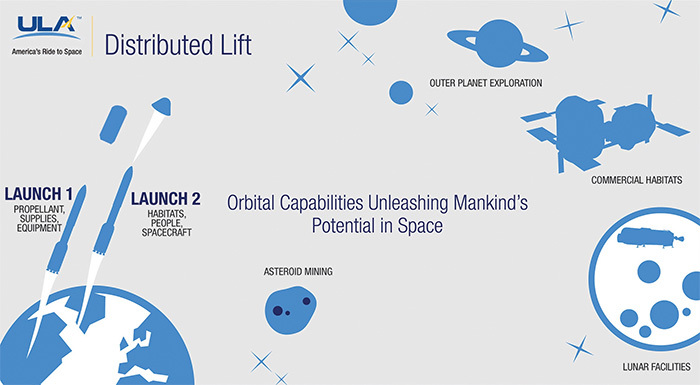 ULA believes that distributed lift will enable concepts such as commercial habitats, propellant and water depots, asteroid mining, and lunar bases. You are currently browsing the archives for the United Launch Alliance category.